Today you will take a flight to China’s “Pearl of the Orient”—Hong Kong. After arriving in Hong Kong, you will take a connecting flight to Kunming. There you will be greeted at the airport by CIT’s professional bilingual tour guide and escorted to the hotel where you will be staying overnight. Kunming, called the “Spring City” or the “City of Eternal Spring” because its weather is mild throughout the year, is the capital of Yunnan Province. Among its approximately 7 million inhabitants, there are members of many ethnic groups: the majority Han, as well as numerous minority groups like the Bai, Ni, Dai, Hani, and Naxi. 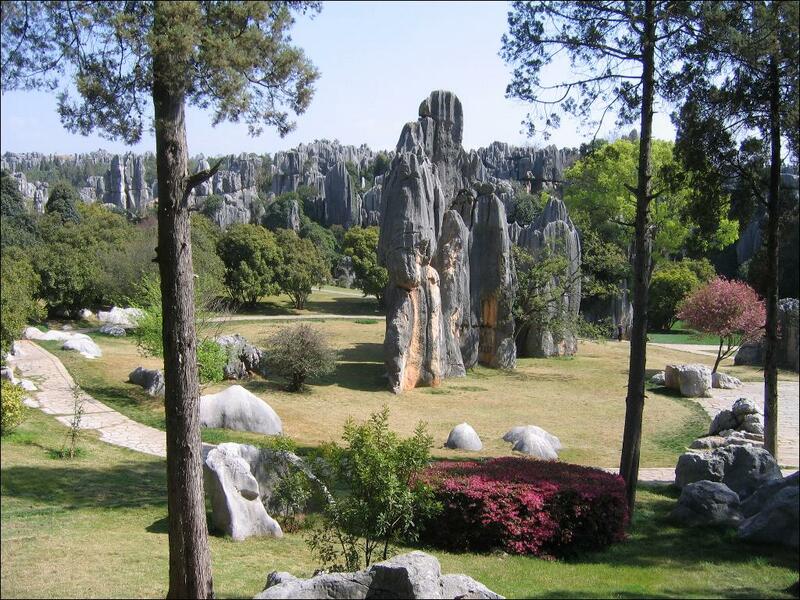 First you will visit a place famous for its natural scenery: the Shilin (“Stone Forest”) Scenic Area, which takes its name from the limestone pillars that rise like giant trees over the landscape, creating a truly strange and unique sight. The tallest of these pillars rises to a height of 30 meters. You can stroll along footpaths through the “forest” and enjoy the famous sights in the area, which include Lion Pavilion, Sword Peak Pond, Lotus Peak, and Sea of Romance. 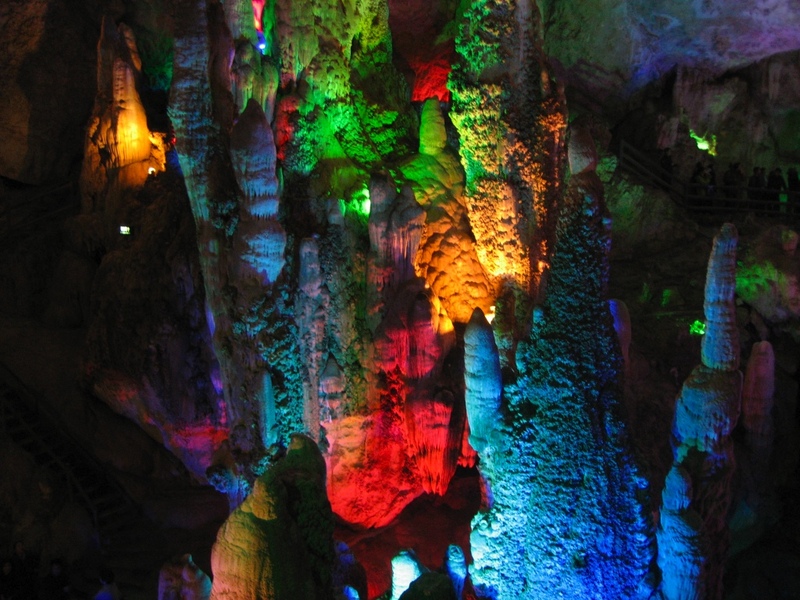 From Shilin you will proceed to Jiuxiang, a “key national scenic area” whose main feature is a cluster of limestone caverns. Among other striking sights, the caves feature a spectacular waterfall that produces a sound like thunder. After touring the caves, you will return to Kunming for a dinner of “mushroom hot pot,” a famous local dish. Kunming is China’s largest producer of fresh flowers, so after breakfast, you will head to Kunming’s traditional Fresh Flower Market, where you will overwhelmed by a fantastic array of flowers and flower arrangements. If you’d like, you can buy dried flower handicrafts as a souvenir of your visit. Next, you will tour Grand View Tower, located in Grand View Park, whose gates feature an engraving of a famous poem written during the Qing Dynasty that is believed to be the longest “antithetical couplet” ever written. Admire the view of the many boats dotting the waters of Lake Dian, to the south of the park, against the backdrop of the nearby Western Hills. Afterward, you will travel to Singing Phoenix Hill to visit Golden Temple, a well-preserved Taoist temple made of bronze that is the largest such temple in China. Then you will head to Dali to tour Dali Old Town, originally built in 1382; along the way, you will stop to take in the imposing sight of Chongsheng Temple’s three towering pagodas. You will have some free time to experience all the sights of the ancient city of Dali, including Foreigner Street, with its distinctive blend of Eastern and Western, ancient and modern. 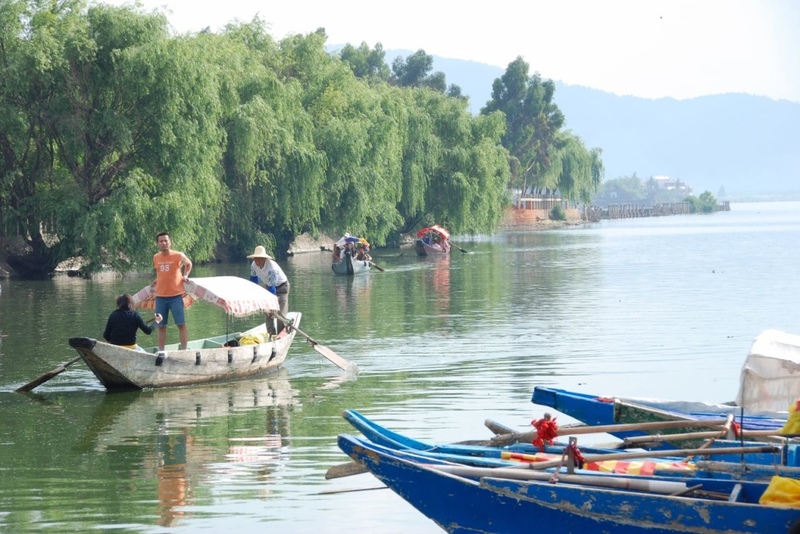 After breakfast, you will head to the docks at Lake Er (sometimes called Erhai Lake), the second-largest lake in Yunnan Province, to take a boat trip. Shaped like an ear, from which it takes its name, the lake has an elevation of 1,972 meters above sea level and covers an area of 251 square kilometers. 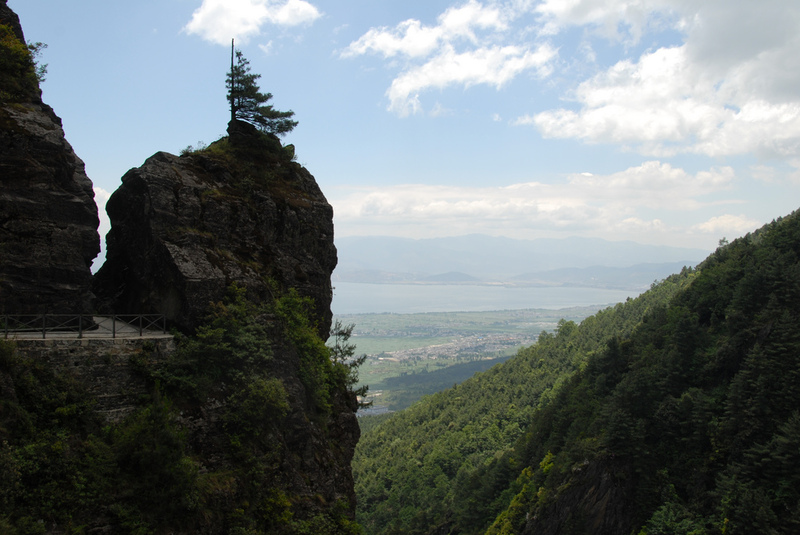 Lake Er and Cang Mountain (“Jade Green Mountain”), which rises on one side of the lake, combine to form a harmonious “mountain-and-water” (shānshuǐ) scene. You will visit Erhai Park on the south side of the lake to admire the view. We have also arranged for you to stop in Xizhou, a lakeside town famous for its architecture, to tour the traditional family estate of the Yan clan and see a “Three Courses of Tea” song and dance show, traditionally performed by the Bai ethnic group as a way of welcoming guests. Afterward, you will ride up Cang Mountain on a chairlift to enjoy a distant view of the lake, spread beneath you like a crescent moon. Today you will take a tour bus to the “Switzerland of the Far East”: Lijiang, which literally means “beautiful river.” First you will head to Wangu Pavilion, located on Lion Hill, where a stunning view of picturesque Lijiang will be laid out before your eyes. Slowly scan the sea of trees around you; to the north you can see the thirteen peaks of Jade Dragon Snow Mountain, and to the east you can see Lijiang Old Town and the palatial spread of the Mu Family Mansion (or Mu Palace), which was modeled upon the Forbidden City by Governor Mu of the Ming Dynasty; together they create a spectacular sight. Next, you will visit the mansion itself, whose complex of buildings is an architectural masterpiece. Later you will have free time to explore the shops, restaurants, cafes, and bars that line the charming streets of Dayan, the most popular “old town” area of Lijiang. 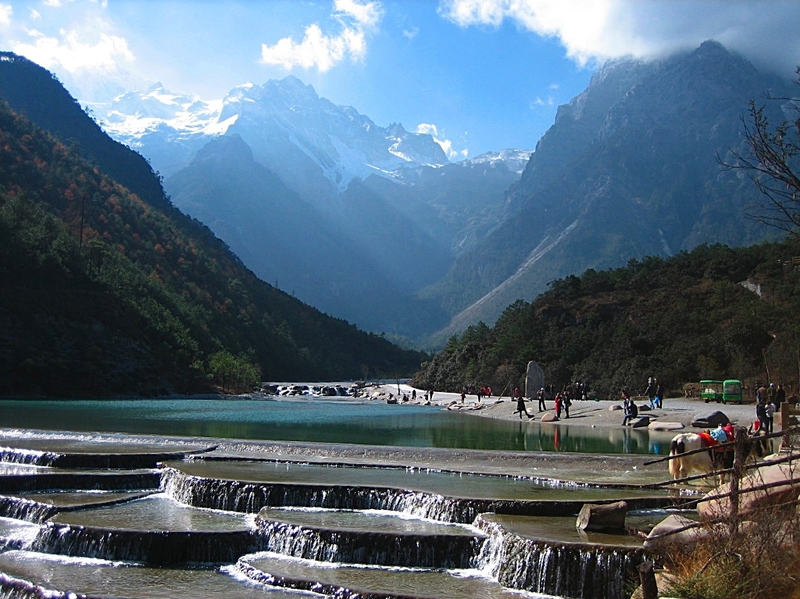 After breakfast, you will proceed to Jade Dragon Snow Mountain, which rises like a tower over the Jinsha River in the northwestern part of Lijiang. Its main peak has a height of 5,596 meters above sea level and is snow-capped throughout the year. Your trip to the mountain will take you across Dry Sea Meadow, a vast open part of Lijiang Valley, to reach the best position from which to admire its peaks. Then you will take a gondola up the mountain and walk through an unspoiled forest for ten minutes or so. Suddenly a broad, beautiful field will appear before you: Cloud Fir Meadow. After taking time to stroll along the path and absorb the magnificence of the scene before and around you, you will head back down the mountain and stop to admire the falls at White Water River, where you can get up close and personal with a group of trained yaks. Then you will visit Jade Water Village, whose beauty people have described by saying that the pure “jade water” of its pools and streams extends all the way up to the top of the mountain. The Naxi people, whose ancestral homeland is Lijiang, believe the area to have special fēngshuǐ (Chinese geomancy) characteristics. 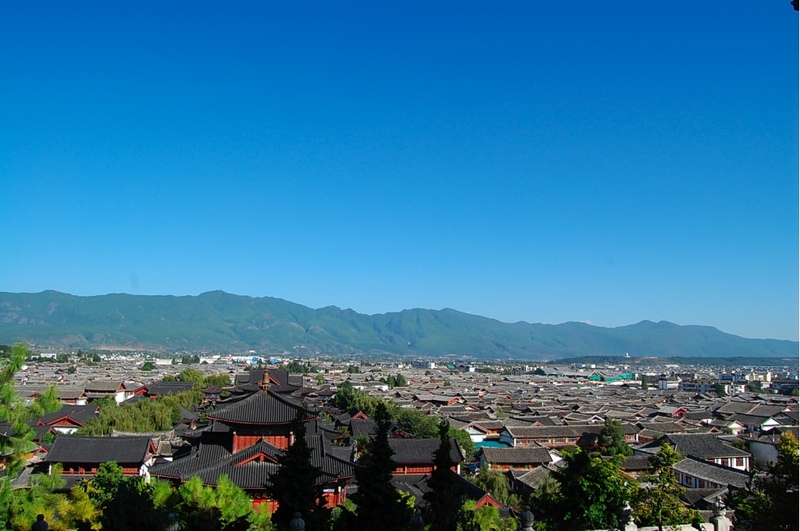 Afterward, you will return to Dayan, which also features a strong Naxi cultural influence, for more relaxed leisure time; one visit is insufficient to fully explore and appreciate this expansive old town area. After breakfast you will begin your journey to Xiānggélǐlā (the Mandarin equivalent of “Shangri-La”), located in a mountain basin at an elevation of over 3,300 meters above sea level. It combines snowy mountains, canyons, prairies, lakes, unspoiled forests, and ethnic culture into one stunning scene. Along the way, you will enjoy a view of the headwaters of the mighty Chang Jiang (the Yangtze River)—here, it is actually called the Jinsha River—and stop at the world-famous Tiger Leaping Gorge, which will thrill you as you travel along the gorge and come to an extremely narrow stretch where the water roils thunderously. 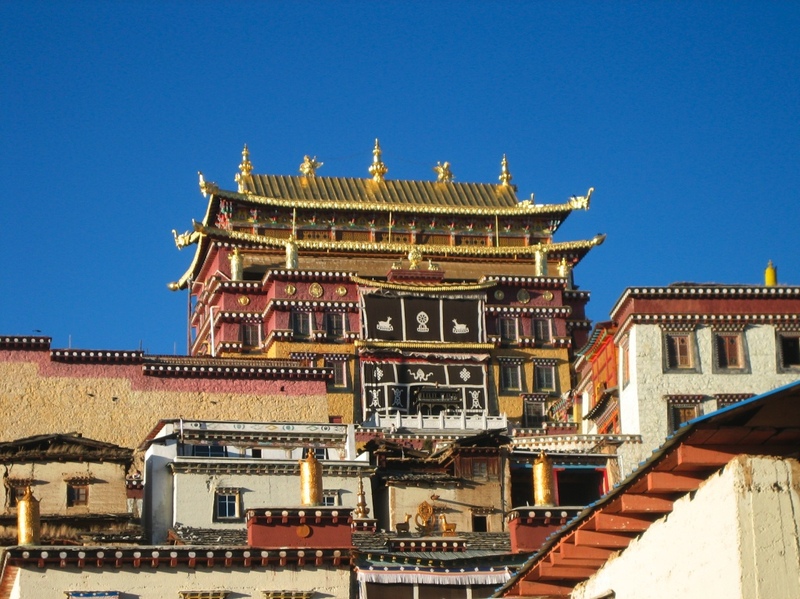 After you arrive at Xianggelila, you will take a tour of the Songzanlin Monastery, the capital of Tibetan Buddhism in Yunnan Province, where 700 Tibetan monks reside. After breakfast you will visit Pudacuo National Park. 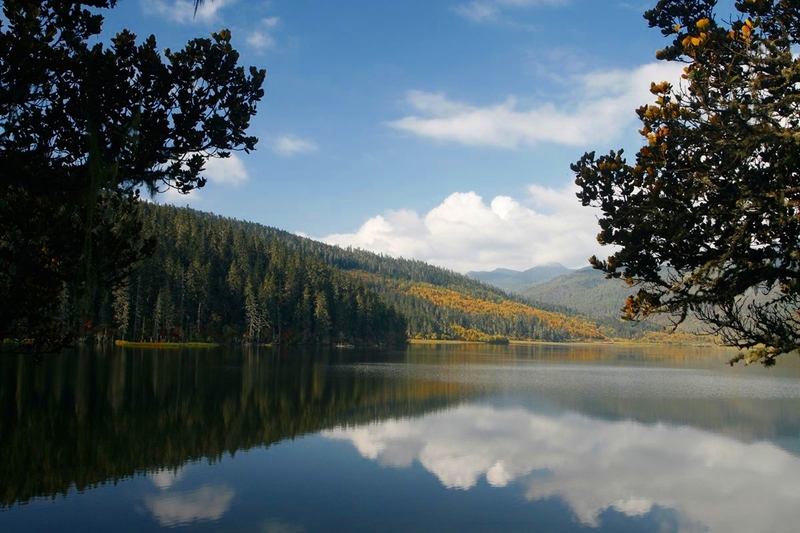 Among the many lakes in the area, the most beautiful is Bita Lake (“Emerald Pagoda Lake”), whose water has an emerald-like quality throughout the year. From there, you will head to Shudu Lake, whose crystal-clear water is replete with fish swimming peacefully to and fro. Surrounding the lake is forest growth thick enough to screen out the sun and sky, and adjacent to the lake there is still a pasture for cows and sheep, giving the area the appeal of traditional Tibetan life. Afterward, you will tour the Xiagei Tibetan Culture Village, a classical Tibetan-style village nestled between mountain and stream, where the atmosphere of folk traditions is strong. The Xiagei Cultural Eco-Tourism Village, a “village within a village,” is also located here. More than twenty Tibetan families live here, keeping their traditional culture intact. Here you can enjoy sights representative of Tibetan Buddhism such as Buddha statues, pillars inscribed with Buddhist scripture, water-powered prayer wheels, bronze prayer wheels, and even sheepskin prayer wheels, each of them unique. Your dinner will feature authentic Tibetan-style food. Afterward, you will have free time to stroll along the streets of Zhongdian Old Town, where you can buy unique local souvenirs and soak up the area’s distinctive culture, a combination of Tibetan and Naxi influences. Today you will take a flight back to Kunming. 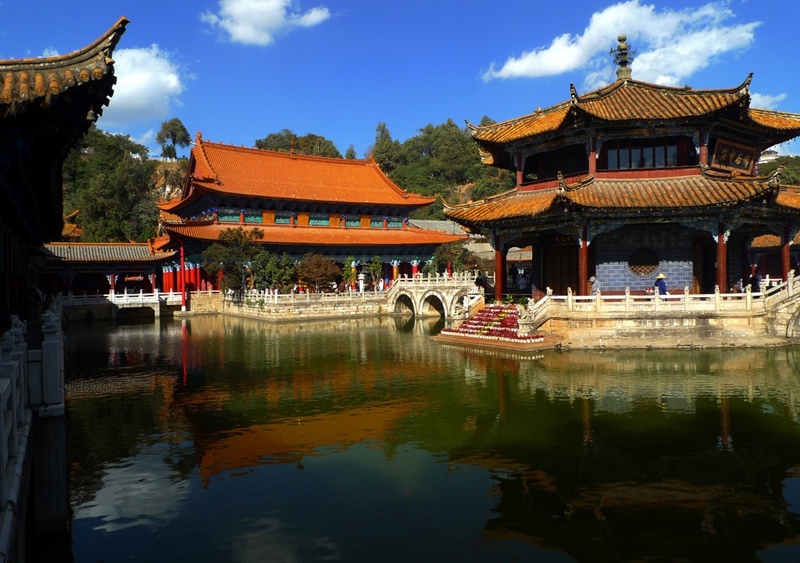 There you will visit Yuantong Temple, the oldest and largest Buddhist temple in Kunming, which boasts spectacular sights like the Yuantong Treasure Hall and the Octagonal Pavilion. The temple contains halls devoted to all three major branches of Buddhism. Over Yuantong Temple’s 1,200-year history, artists have inscribed its many jagged mountain rocks with expressions of praise for the temple. Day 11: Kunming – Hong Kong – U.S.A.
Today you will wrap up your tour by taking a flight to Hong Kong, where you can catch a connecting flight to the U.S.A. and home, sweet home.